After modelling 2 layouts at gn15 scale (maple shack and vulcan iron works) I switch to 7/8 th scale (or 1/12 scale, doll house scale). It's a fictional layout for fisherman located at woolacombe (north devon, uk). 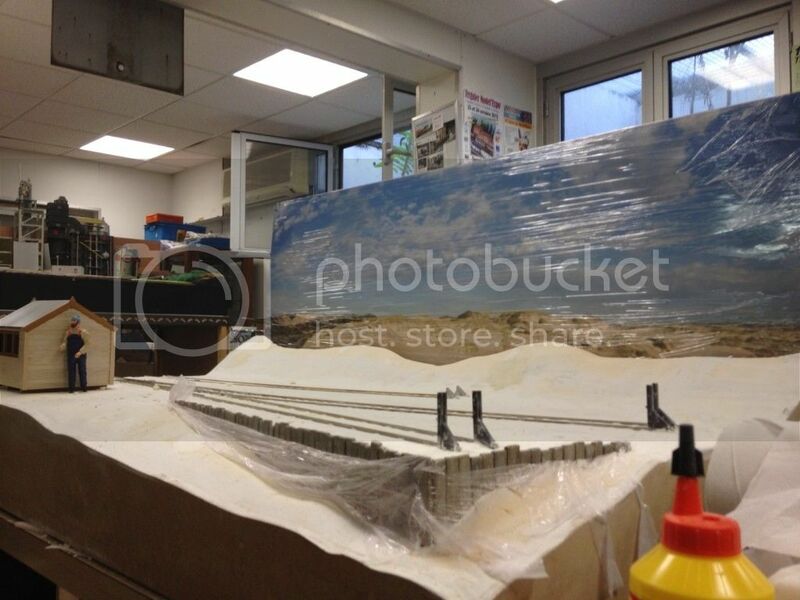 The size is 140 cm by 72.5 cm plus a fiddle yard not shows). The base is an hollow core door plus pink foam on it and a little plaster. Last edited by franckcombe on Sat Jun 30, 2012 3:19 pm, edited 1 time in total. Hi Franck - the new layout looks very impressive. I like the building - lots of detail in the bigger scale. Is that a photographic backdrop under the cling-film? What rolling stock will you run on it? First of all, I pay a visit to your site and I recognise some of yours layouts. I like particularly your 16 mm one's. You are like me, you love to build critters. I got 10 at gn 15 scale and I'm at 9 at 7/8th scale. For the rolling stock, I have 30 wagons (lgb, hlw, backmann ) more or less modificated or or entirely kitbatched. The rolling stocks will transport the fishing materials, the fishes, the men and very small boat. I need to paint the entire rolling stock. The backdrop is under the cling film to protect him. I will do new picture without it. Hi Franck, The layout looks great. I can already smell the sea very inspiring. Looks like a great start. Just how big is that main board please? Woolacombe was our standard holiday spot for years when I was a child - many happy memories. 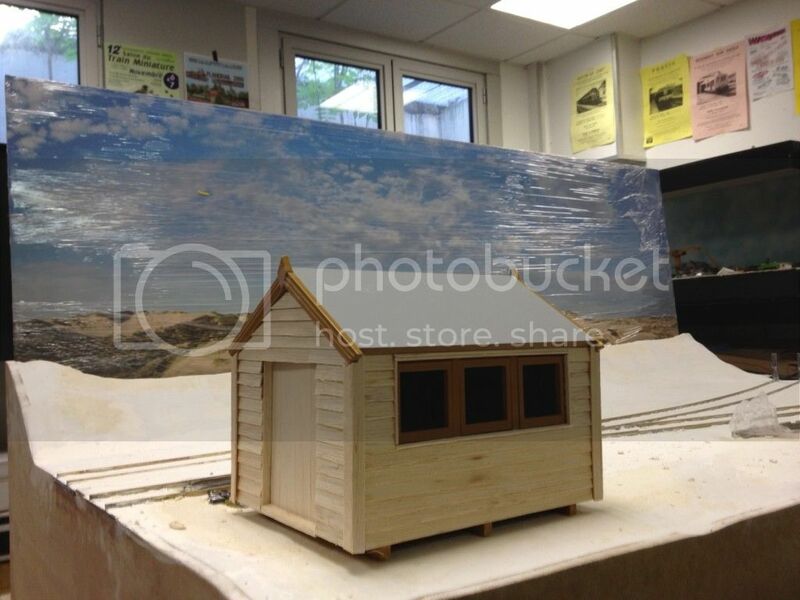 Have you seen Steph' H's winning seaside module from the competition run by Back2bay6/Modelearth at Telford last year? Pics can be found here (I think I am correct in saying that is one of the areas of the Lounge that are open for all to see, whether member or guest, although I know you are a member there anyway). Anyway, I look forward to further progress. Bilco wrote: Hi Franck - the new layout looks very impressive. I like the building - lots of detail in the bigger scale. Might as well build the real deal! Looks good, really. The size is 140 cm by 72.5 cm plus a fiddle yard not shows. I spent also 2 weeks at woolacombe during the summer ( 2 weeks of rain ), it 's one reason of my choice for the place plus the second reason is that my name is combe. I have seen also the seaside module at telford, it's a good source of inspiration. For the sea, I will run a cd of sea side sound. 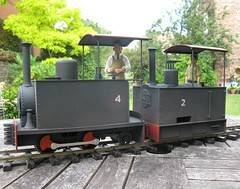 The locos are equipped with loksound decoders. 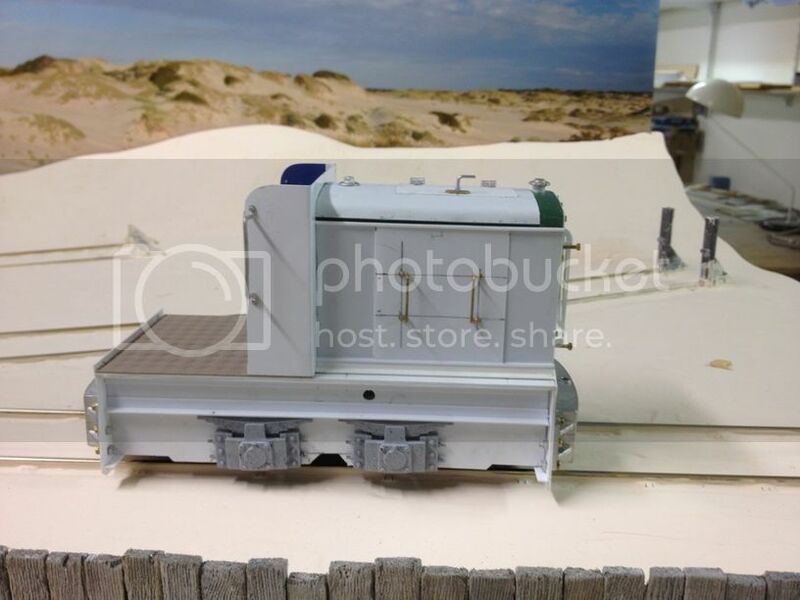 I have nearly finished my lister and ruston for back2bay6 (top quality models) and I will scratch build a simplex loco. Nice idea Franck, I know Woolacombe well, it is only an hour drive from here and have spent many weekends there. That is quite a small layout in 1/12 but looks a lot bigger. Looking forward to seeing how it develops. Good concept and what a great layout its going to be. What are you going to use for motive power? 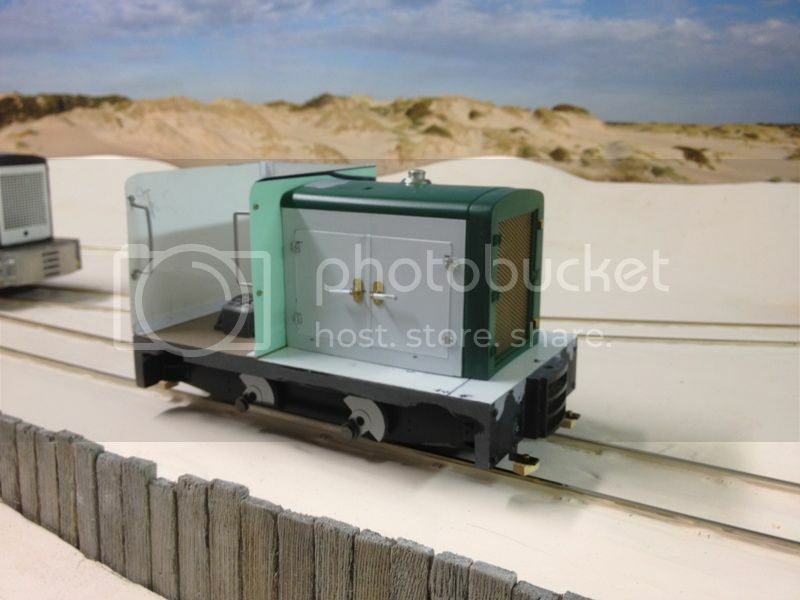 Like you, I have been attracted to the larger scale and have built a mine loco on a cut down 0 gauge Atlas chassis and I am just finishing a 1/12th scale model of a Sidelines Dragonfly. Please make sure to keep us posted of your progress. For the motive power, I have already realized 5 locomotives. I use mainly 040 davenport motive power from bachmann It's cheap, reliable, ready for dcc and very heavy for a good electricity pick-up. 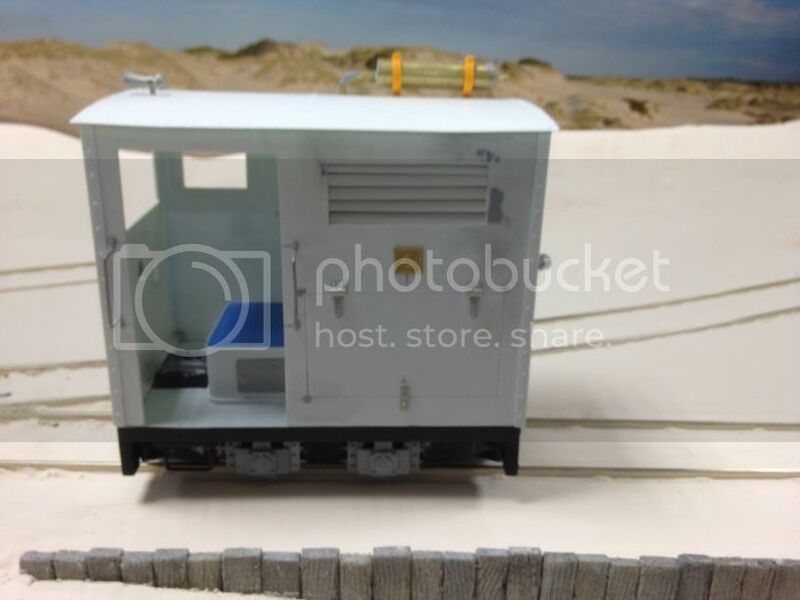 You can find it at 99 us $ at trainworld.com. Beware it seems that bachmann has stopped the production. I have done the same things at gn15 scale with the 040 davenport in on30 version and I was very satisfied. I have also modified one HLW mack motive power. 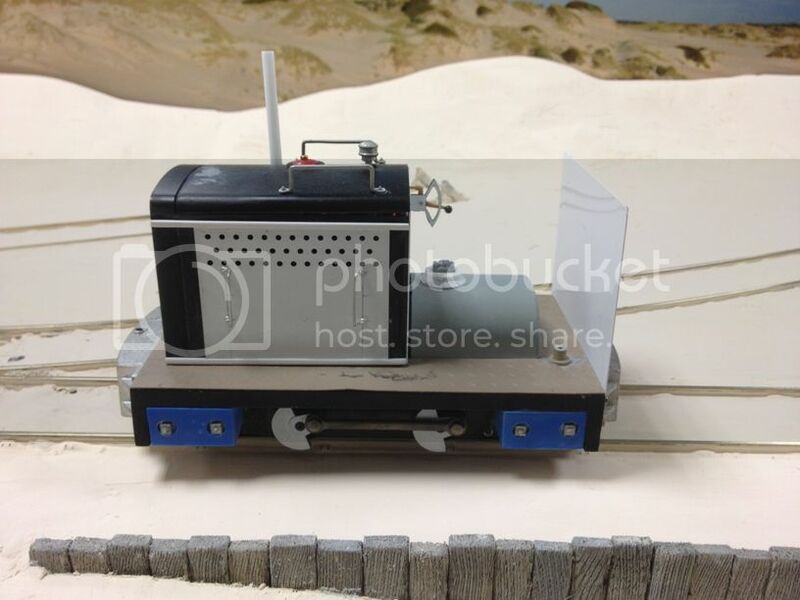 I will use also the motor and axle from HLW from Woodys. Tomorrow I will take pictures and post it. For the motive power, I made four variations around the 040. The locomotives are just shown without all details and spare parts because I have to paint them and I don't glue them before. Very nice indeed. 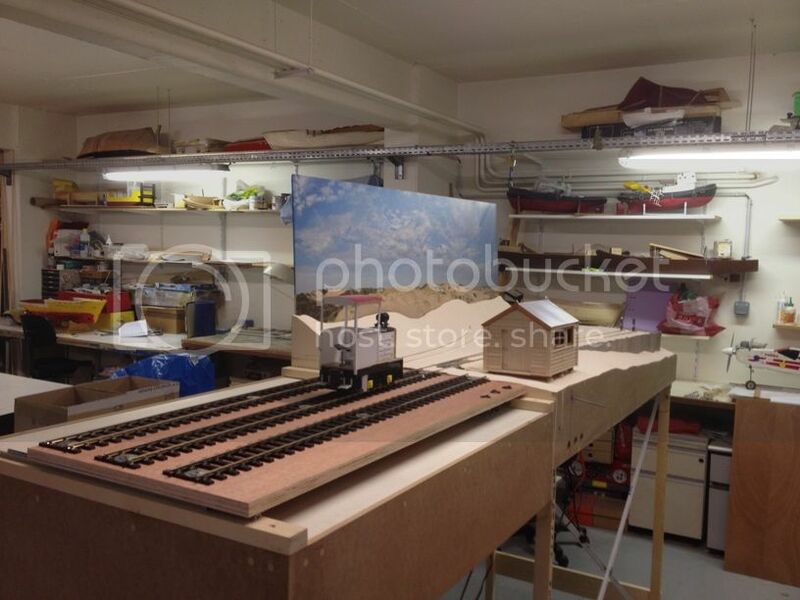 That set of photos is useful to show how you are doing various aspects of the locos' builds. All looks great Franck, the loco fleet is very impressive so far. Franck, thank you very much for the pictures of your locos, they are very inspiring. I especially like the boxcab and look forward to seeing it painted. I have only completed two locos, shown below, but have two more under construction. Your pictures have encouraged me to finish them and get something running. Yours two locomotives are plenty of charms. I don't imagine that you could do a steam from a 040 and you do it ! I made some progress during september : I rust the rail, put 2 layers of sand and I begin to add few plants. I've just reregistered the earlier pics with the fiddle yard and locos that demonstrate once again the chunkiness of these larger scales. Great progress Franck. Have you painted any of your logos yet? I'm focusing on the layout for the moment. I soon as I finish it (in December or January), I will start the painting session for 8 locos + 36 wagons. I will be occupy at least until next summer. I have to be ready for the autumn 2013 for planned exhibitions. Wow. Breathtaking vistas. That sand ans sprouting foliage is something else! Very nice Frank! The sand and rust are very appealing!